Here we are at the Designed To Color and Li'l Inkers Designs blog hop. So glad you came along for the hop! Most likely you have arrived here from Judith's lovely blog and at the end of my post, I will direct you to Leah's fantastic blog. But while you are here, I hope you will enjoy today's card made with a digital stamp from Li'l Inkers Designs. The stamp is called Rain Boy. But I am using it as a thoughtful birthday wish card. If you just happened to be here without starting at the beginning of the hop, let me direct you to the Designed to Color website where you can catch the blog train's first stop. Otherwise, it is on to Leah's blog you go. Be sure to leave a comment on each blog you visit so you can be entered to win 1 of 2 wonderful prizes. And don't you know, I would LOVE for you to follow my blog. I post a new project every single day! Thanks for coming by. I'll see you tomorrow. My oh my Susie!!! This is just amazing!!! Thank you so much for helping us our with this hop! Your card is just breathtaking!!! Oooh, your little Rain Boy is so colorful! I love him! Can I have an umbrella like his?? Thanks for teaming up with us at DTC! What great colors you chose. Beautiful card. Very cute--I like your coloring and the chevron background. Gorgeous colouring of that lovely image and very pretty papers! Wonderful card. The colors are amazing. and your colouring is so nice. I love it. Beautiful card!Love the chevorons and the color combo! Beautiful! I love your coloring. fabulous color combo on your card! So cute! Fabulous coloring and I love the paper. TFS! LOVE the way everything matches the colors in the chevron pattern. Love that chevron paper and all the bright colors in this card! Gorgeous coloring, love the color combo.. beautiful card..
Susie, love your style. This is a sweet card and love the Chevron paper. Great card! Love those chevrons. Wow, a new project everyday!! That's awesome! Such great colors. Your image is beautifully colored. That is beautiful!!! THe coloring on that umbrella is awesome! 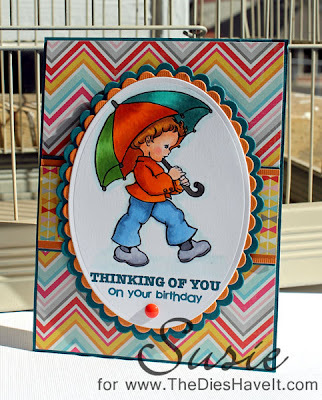 Making the umbrella so colourful works so well for a bday card...love the chevron background. Susie - that is an adorable card. love the umbrella and colors. Sending some bloggy love from the hop. Glad I was able to visit. What a bright, cheerful card! Love those pattern papers! So cute and colorful! I love the effect of the layered scallop mat against the coordinating chevron patterned paper. Stunning! cute card...love the bright colour patterned paper bringing a cheerful love to the receiver! Love this vintage image with the bright bold colors! Such a fun card! Darling card! Love the colors! Great coloring job too! Precious card and love the colors for the little image. Love the background papers. The image reminds me so much of images when I was growing up. Those old 50-60 images that I love. Great card. Lovely card with vibrant colours. You've coloured it beautifully too. I love the bright colors on this fun card! Love the colors of your card - bright and rich! Your coloring is great and the chevron pattern paper makes the card. Beautiful card! I love the bright, fun colors! Even though it might be raining, the little boy looks happy. A bright, cheerful card. Great job.